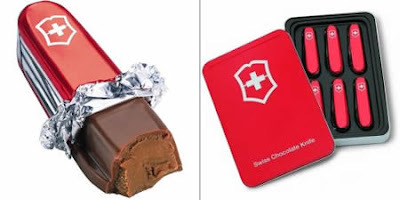 The chocolate is packed like real Swiss Army Knives that you wouldn't belive that it is chocolate unless you touch it, click here to see the details. 3ajeeeeeeeeb!!! oo i agree with nawarii!!! ur blog is so amazing! no mojamala!!! love it! Thanks, I'm glade u liked the blog! WOOOOOOOOW that is sooooooooooooooo weird! but 3aJEEEB!